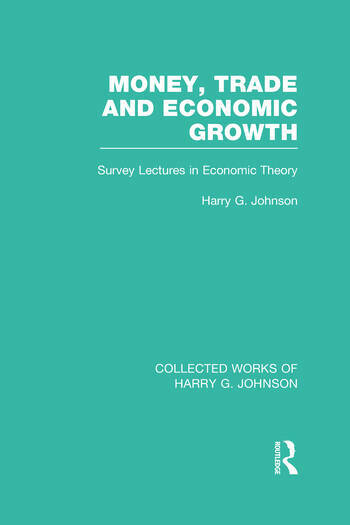 This book deals with the effects of international trade on economic growth and money. It also re-examines Keynesian theory and analyzes economic growth in an affluent society in terms of planning, economic and social policy. Preface Part 1: Trade and Growth 1. The Balance of Payments 2. Comparative Costs and Commercial Policy 3. The Economic theory of Customs Union Appendix: Marshallian Analysis of Customs Union 4.Economic Development and International Trade. Appendix: Bibliography of Recent Work on Trade and Growth Part 2: Money 5. Monetary Theory and Keynesian Economics 6.The General Theory After Twenty-Five Years. Part 3: Economic Growth 7. Planning and the Market in Economic Development 8. The Political Economy of Opulence 9. The Social Policy of an Opulent Society. Index.